Community 3D printing platform, MyMiniFactory has launched a new competition with 3D design software Vectary. The winner will receive a 3D printer valued at $3,600, the competition is also offering a number of other prizes. Vectary offers a browser based 3D design tool that allows users to easily import stl’s and make modifications. The software can be used for free, will a paid option expanding functionality. Recently Vectary partnered with MyMiniFactory to allow Vectary users to easily import remixable models from the MyMiniFactory platform, as well as export their creations back to MyMiniFactory for the community to download and 3D print at home. 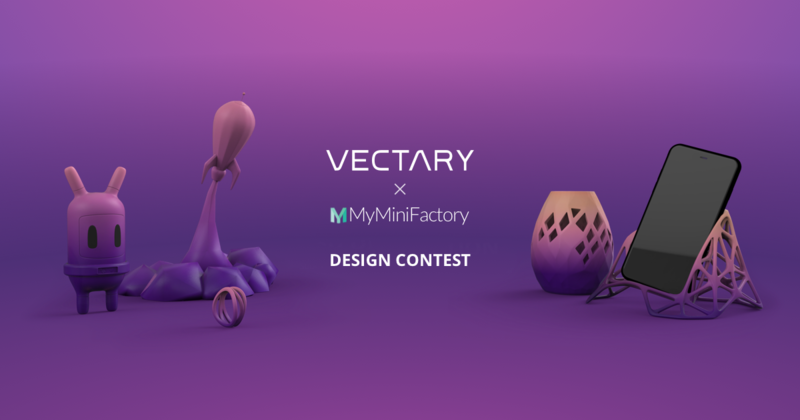 In light of this partnership, MyMiniFactory and Vectary have teamed up once more to bring their users a new 3D design competition. This new competition tasks users with creating 3D printable designs which are then to be shared on the Vectary and MyMiniFactory platforms.